Disclosure: This is a sponsored blog post. I received a beautiful package from Red Gold with cans of tomatoes and sriracha ketchup, an insulated tote bag, and a gift coupon for Laura's Lean Beef... but all opinions are 100% my own! This post contains links to Red Gold websites, and I am providing the giftcard for giveaway on my own dime. Red Gold has a fun summer promotion for you to participate in called the Red Gold Summer Grilling Party! They'd love for you to use their tomato products this summer as you're grilling; I love them because their tomatoes are grown in the Midwest... just like me! Red Gold will give away a Large Big Green Egg each week as well as 1,000 insulated tote bags; the giveaway runs until July 22, 2015 on their Facebook page. I was going to do a great grilling recipe, but then we were overtaken by terrible thunderstorms and weather. I had an umbrella malfunction one day and got so drenched, I had to leave work to go home and change! 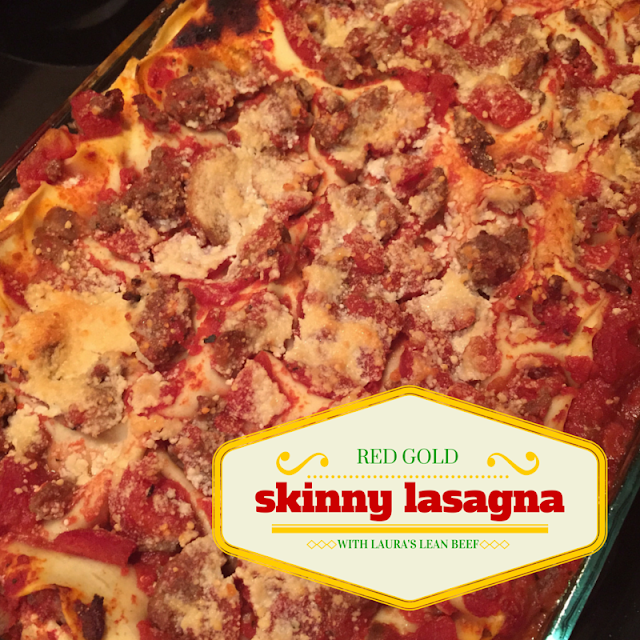 Needless to say, I was craving some warmth and comfort... so I turned to a really great recipe from Red Gold for their Skinny Lasagna, using Laura's Lean Beef. Preheat oven to 350° F. In large mixing bowl combine water, crushed tomatoes and diced tomatoes, black pepper, Italian seasoning and ground round, stir to combine ingredients in the sauce. Cover the bottom of a 9x13x2 inch baking pan with 1½ cups of sauce mixture. Arrange 1/3 of noodles on top of sauce, slightly overlapped. Top with ½ of cottage cheese, ½ of mozzarella cheese and 1 cup of sauce. Repeat layers and top with last 1/3 of noodles and the remaining sauce. Sprinkle with Parmesan cheese. Cover tightly with foil and bake for 1 to 1½ hours; until noodles are cooked. Let stand for 10 minutes before serving. I served it with some garlic toast, and Dan LOVED it. We're actually enjoying the leftovers, and he told me he'd like to have it more often. I really love the Red Gold Tomatoes with Basil, Garlic & Oregano; the scent when you open the can just smells incredible, like your favorite Italian dish. I've also read that you CAN cook lasagna on a grill, so that fits in with the summer grilling theme, right? 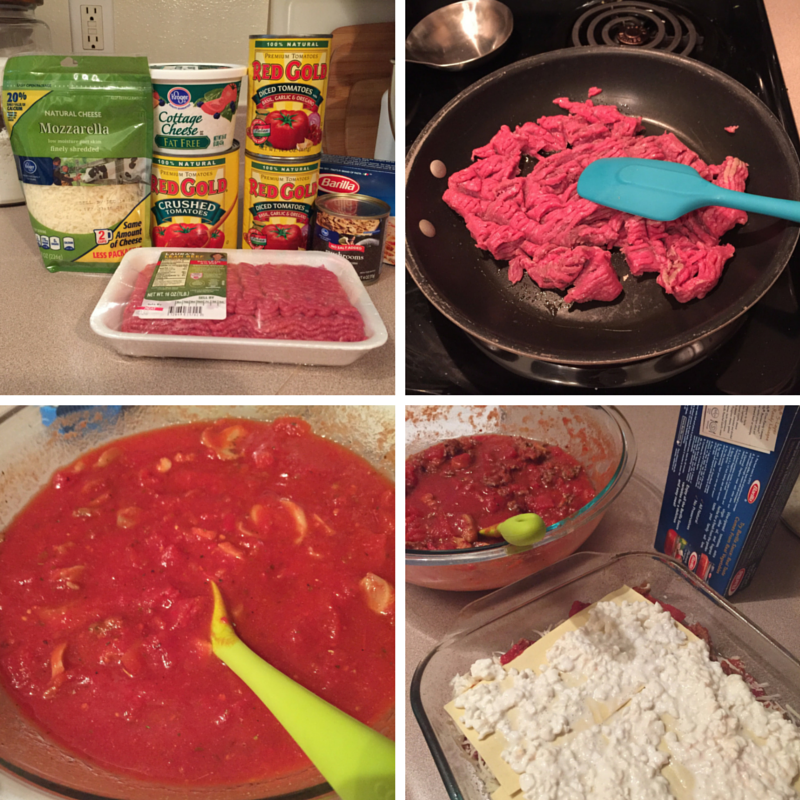 Because I loved cooking with Red Gold and Laura's Lean Beef (which I found at my local Kroger) I am offering a $25 Kroger giftcard plus some Red Gold goodies to my readers! One reader will win a $25 Kroger giftcard (use it purchase Red Gold and Laura's Lean Beef products! ), an insulated Red Gold tote bag, and a collection of great grilling recipes. You must be a resident of the USA, 18+ to enter. Please use the Rafflecopter form to record your entries. P.S. Don't forget to try their NEW Sriracha Ketchup! I mean, it's two amazing things in one bottle... we tried it on fries and burgers and it's great!